The partnership offers health insurers and providers a radical departure from fragmented attempts to identify high risk patients and create the right care plans for them. No longer will providers be expected to perform these tasks without actionable data at hand. And never again will health insurers have to chase after charts for annual reviews—which were always questionable exercises, given how outdated the data was by then. These are unprecedented capabilities that significantly improve the ability of providers to take on risk. Indeed, HealthBI has built its entire business model around this concept. The company’s flagship point-of-care platform aggregates data from a comprehensive collection of sources— including health plans, care providers, pharmacies, health information exchanges (HIEs) and others. It is typically provided to physicians and clinicians by healthcare payers, provider networks and other entities that work with providers, and connects all care teams in a single virtual setting. From this same shared platform, care team members can manage even the most complex populations, identify members at high risk or in need of preventive measures, drill down into individual members’ current healthcare activity and collaborate together on integrated care plans. The partnership effectively catapults HealthBI, a company that was founded to simplify and scale quality-driven, value-based care at the provider practice level, into position to service a significant portion of the nation’s Medicare Advantage plans. Fueled by a continuous influx of Baby Boomers, Medicare Advantage enrollment numbers have increased every year for the past seven years, a trend that will increase over the next decade. Care providers need actionable data now more than ever to identify high-risk patients who would most benefit from connected care management programs. To that end, HealthBI strongly believes providers can help members enjoy a higher quality of health at a lower cost, and with a lot less hassle than risk-based contracts too often require. This is why we are so pleased to collaborate with Optum to equip providers with the real-time data tools and insights they have long asked for, and the support to use these resources to their patients’ best advantage. In turn, Optum has seen firsthand how HealthBI’s flexible point-of-care platform supports more than 63,000 provider practices nationwide to improve quality and risk performance. Today, the platform is in clinical sites across 50 states, with a 95 percent provider adoption rate. In short, the HealthBI partnership with Optum represents an exciting new chapter for true connected, value-based care. And we believe it will definitively prove that payer-provider collaboration moves the needle on better patient outcomes at a lower cost. Visit Optum’s media alert on the partnership here. 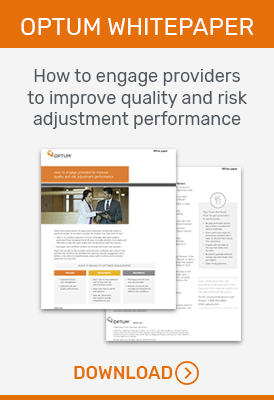 For additional information about Optum’s provider enablement strategy, including the technology component supplied by, download the free white paper How to engage providers to improve quality and risk adjustment performance.